The second largest volcanic eruption in human history was much larger than previously thought, scientists say. The Bronze Age eruption of Thera near mainland Greece would have devastated ancient civilisations in the region. Ash would likely have plunged much of the Mediterranean into darkness, and tsunami would have wrecked local ports. A survey around what is now the island arc of Santorini shows volcanic pumice to a depth of 80m covering the ocean floor for 20-30km in all directions. By examining echoes from volcanic deposits on the ocean floor, researchers have shown that the Aegean eruption of Thera 3,600 years ago may have propelled 60 cubic km of magma out of the volcano's crater. The new estimates suggest that the blast was half as large again as had earlier been supposed. "It was clear that this was a very substantial eruption to begin with, but this adds an exclamation mark," says Steven Carey of the University of Rhode Island, US, a co-author on the study. The eruption dwarfs even that of Krakatoa, which ejected about 25 cubic km of molten rock, ash and pumice in 1883, killing 40,000 inhabitants of Java and Sumatra in just a few hours. An eruption of Thera's size would have had drastic implications for the people living in the region. No bodies were found in the nearby settlement of Akrotiri, which was buried in ash in a similar way to Roman Pompeii. The city had been evacuated shortly beforehand. But giant waves from the blast would have devastated ports and coastal areas. Tsunami deposits have been found on Crete and the west coast of Turkey. During ash fallout, an area of at least 300,000 sq km would have been plunged into total darkness, say the researchers. Sulphur discharged into the atmosphere would have formed droplets, causing significant cooling of the Earth's surface. 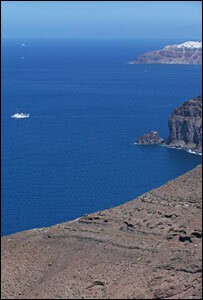 Some scientists have suggested that the eruption may be connected to the decline of the Minoan people, an ancient sea-faring civilisation living on nearby Crete. Others have even tried to link the event to the legendary disappearance of the island of Atlantis. The blast has been termed "the single most famous Aegean event before the fall of Troy". The research team also discovered a bed of hydrothermal vents in the crater of nearby Kolumbo, a small submarine volcano located just to the north-east of Thera. 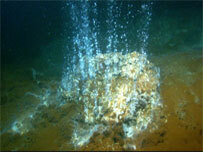 The vents are places where water is drawn through seafloor cracks, is superheated and then ejected. "What this tells us is that Kolumbo has a very active geothermal system beneath it right now," says Carey. "You have to have a lot of heat to drive this kind of vent system." The extreme temperatures and unusual environment of such vents usually attract very specialised forms of life. The vent chimneys are coated in long, tube-shaped bacteria which give them the appearance of "hairy beasts, like woolly mammoths," reports lead researcher Haraldur Sigurdsson. The study was undertaken by the University of Rhode Island and the Hellenic Center for Marine Research. The largest volcanic eruption in modern times was the Tambora blast on the Indonesian island of Sumbawa in 1815. Scientists calculate it ejected 100 cu km of material.